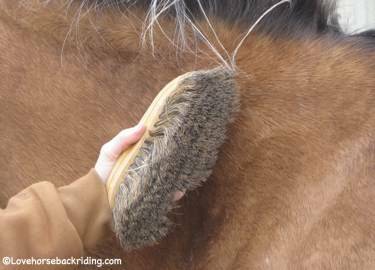 In this four part tutorial about grooming your horse, you started by learning about curry combs, when to use each one, and how. 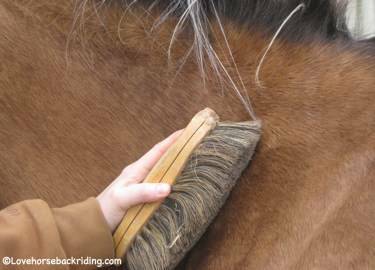 In this next step we'll go over how to use a soft or dandy brush to rid your horse of the dirt you loosened in the prior step. If you just jumped in you may want to go back to the overview to see the steps you'll take. So after you've curried, or as you are moving along in sections you'll want to use a dandy or soft brush to remove the loosened dirt and hair. Dandy Brushes can have a different hardness of the bristles. I recommend using a medium hardness for this task. 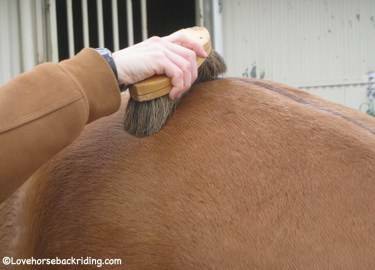 Start by placing the brush flat against the coat as in the picture above. 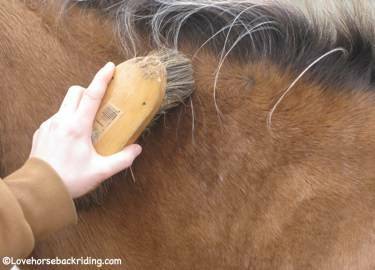 The last step is to give continue to "flick" it, grooming as shown. You'll continue grooming along in this way, all the way back on his body. Above you can see how to move it in an up and down motion the way the hair grows on the flank. And here, grooming over the rump. 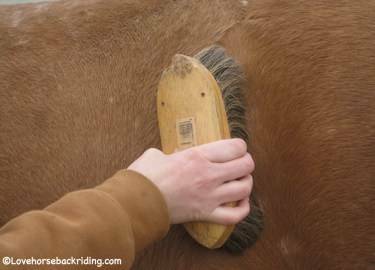 It is important to put effort into flicking the brush as this removes the hair and dirt, especially where the saddle will sit. You can follow with a finishing brush if you'd like to really add some sheen to his coat. But for our purposes, we're going to move on to the face and taking care of the mane and tail.